Helen Carey and Nathan Fuller in Central Park's South Conservatory Garden. 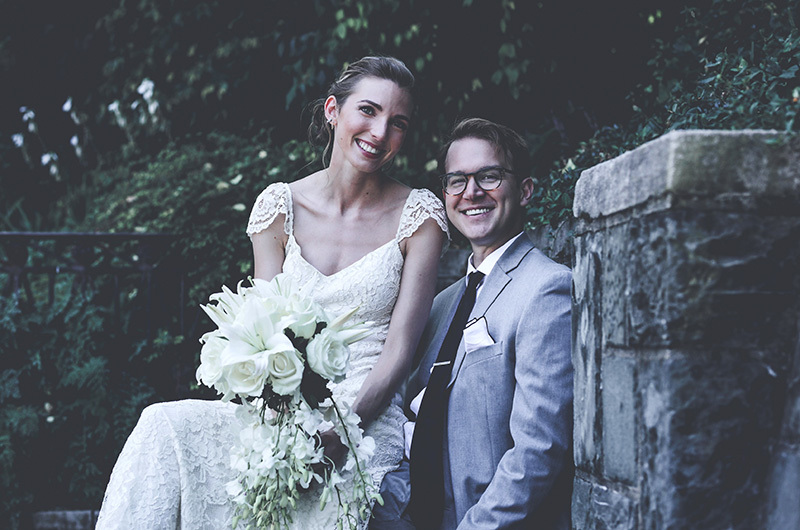 Helen Carey and Nathan Fuller were married on Sept. 16, 2017, in Central Park’s South Conservatory Garden in New York city. The bride is the daughter of John and Mary Carey of Freehold, N.J. The bridegroom is the son of Russell Fuller of Cookstown, N.J., and Emily Logue and Peter Hoyle (stepfather), of Hamilton, N.J.
Nathan’s mother’s side of the family has made Martha’s Vineyard their summer retreat for more than 60 years. Susan and Gordon Logue left their Chilmark home to their children James and Emily Logue, and Nathan and his sisters Holly and Sierra Fuller have spent summers on South Beach ever since. The bridal party included friends Tamar Poulsen, Colleen Cassidy, Michael Zolnowski and Christina Alaimo. The groom’s party included friends Ron Seidel and John Wintermute, and Holly and Sierra Fuller. A friend of the couple’s, Meir Galimidi, officiated the ceremony and performed a poetry reading, as did the father of the groom and Jenna Frazzini, a friend of the couple’s. Helen and Nathan met at The College of New Jersey (TCNJ) in 2008 and currently reside in Morningside Heights, N.Y. Helen works as a copy editor and blogger and has had several poems published throughout the years, and Nathan works in political activism and campaigning. The couple honeymooned in the Greek Cyclades Islands. Kara Johnson and Ryan Leandro of Edgartown were married on June 23 in Katama.